Sure, space-based X-Ray telescopes have been in service since the Einstein Observatory launched back way back in 1978. But the NuSTAR Project is different: It promises to illuminate at the heavens above as never before. While the Chandra Observatory and XMM-Newton improved upon the Einstein Observatory's design, they only did a better job of studying the same stuff: low-energy cosmic X-ray emissions. 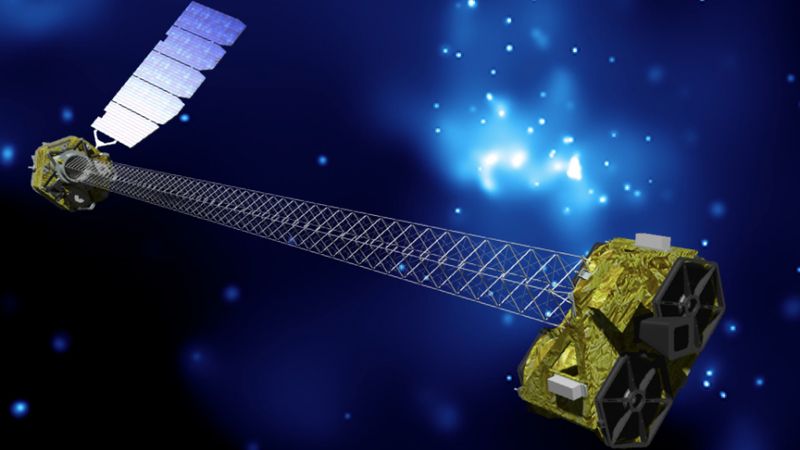 The NuSTAR observatory, part of NASA's Small Explorer satellite program (SMEX-11), will provide scientists with the first focusing telescope that observes the high-energy X-ray (6 - 79 keV) spectrum. Until now, orbiting X-ray satellites have relied on coded apertures rather than optics that actually focus. This feature will provide ten to 100 times the clarity of existing ground-based systems and detect otherwise unseen high-energy cosmic X-ray emissions. To make these observations, the NuSTAR relies an advanced optics system mounted on the end of an extendable boom that focuses the incoming X-rays for a pair of CZT detecting units. The optics system aboard the NuSTAR relies on the Wolter Type I lens, which was developed in 1952 by German scientist Hans Wolter. While his optics were initially built for use in an X-ray microscope, they have since been scaled up to the macro level—1.5-feet long with a 15-inch diameter, and 33-foot focal length. The optics themselves are constructed from the same flexible glass sheets used in laptop and cellphone screens, bonded together with epoxy and shaped over precision polished cylindrical quartz forms. These optics sit at the end of a an articulated 33-foot long mast, built by ATK-Goleta. The mast is extendable—which minimizes space requirements during launch—but provides a stable, movable platform to mount the optics. An adjustment mechanism will help ensure proper alignment between the optics and detectors once the mast is initially deployed and extended. The NuSTAR also uses a dual laser metrology system to correct for image blur. At the other end of the mast are a pair of detection units made of 32x32 pixel Cadmium-Zinc-Tellurium detectors. These devices convert X-rays to electrons more efficiently than other detector technologies. Each detector images independently, transmits the images via a data downlink to a ground station located in Malindi, Kenya where they are recombined for study.